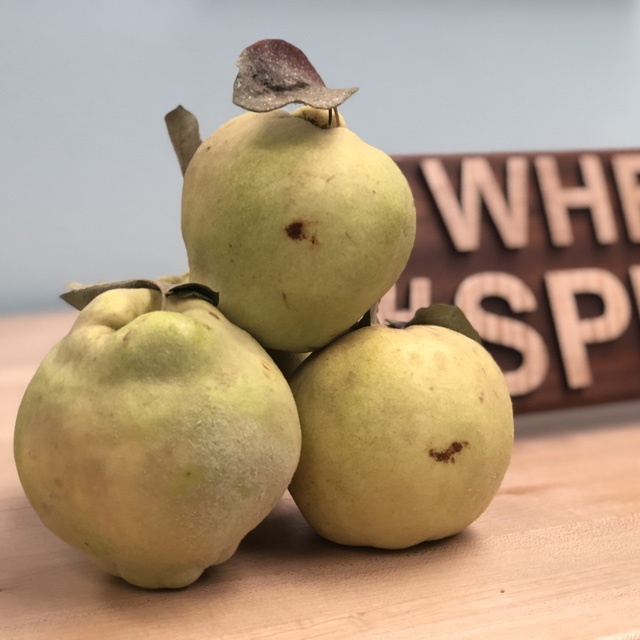 Quince resemble a large, lumpy yellow pear with skin that may be smooth or covered with a woolly down depending on variety. A characteristic common to all varieties is their strong aromatic fragrance, a musky-wild, tropical-like perfume. Astringent and sour, the flesh cannot be eaten raw and requires cooking to be edible. The fruit becomes a rich candy-like paste when slowly cooked and turns a deep apricot color with floral honeyed flavors. 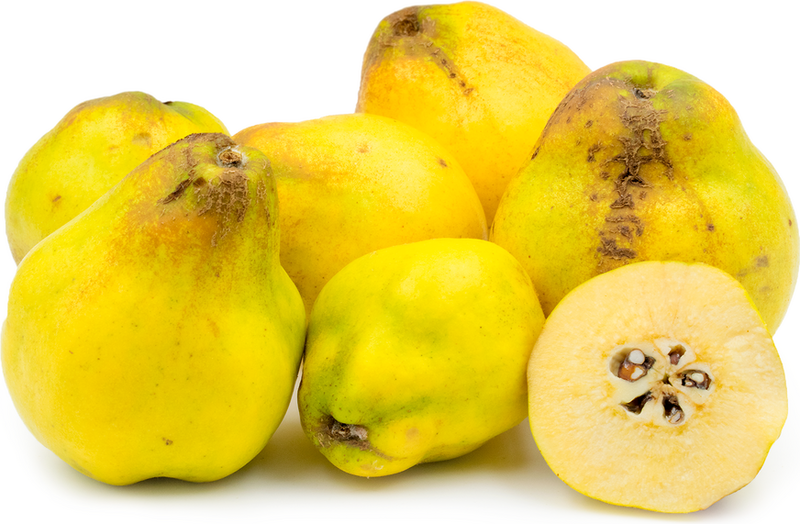 Quince is generally available year-round, with sporadic short time gaps. 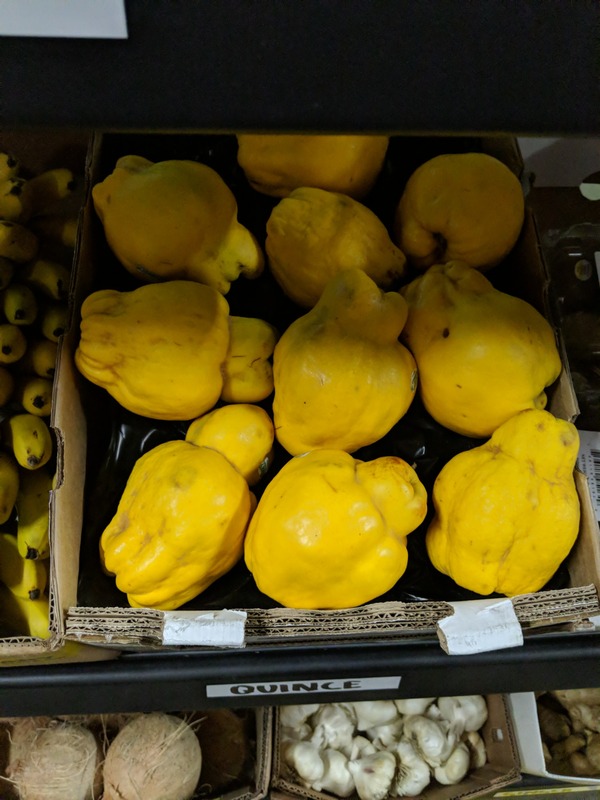 California grown quince (pineapple variety) are harvested in the fall. Quince are botanically classified as Cydonia oblonga, and are the sole member of its genus. At one time they were considered a staple in kitchens around the world including the United States, but are now mainly found in the East, specifically Turkey and China. This aromatic fruit has now been relegated as a specialty item in most of North American but remains popular in many Latin American countries where as a cooked jelly it is known as dulce de membrillo. Rich in fiber, quince provides a moderate amount of vitamin C and potassium. Four ounces of raw fruit contains about 65 calories. With a high pectin content, quince is ideal for jam, jelly, conserves, fruit leather and candy. Poach quince in wine and vanilla beans. Cook down with sugar until solidified; serve paste, or membrillo, with Spanish cheese such as manchego. Cook with other fall fruits, such as apples or pears, and reduce into compote, or add to spiced cake batter. Add cooked quince to ice cream custard. Quince is also used in savory preparations, added to beef and lamb stews, or served, cooked slowly, alongside roasts. For longer storage, wrap fruit individually in a double layer of plastic; refrigerate. Place it where it won't be bruised. This fruit plays a worldwide confectionary role in Moroccan, Persian, Romanian and Balkan cuisine. Adding quince to meaty stews, the fruit is often a customary accompaniment to roasts. Referred to as "melimelum" by the Romans, this Greek name means "honey apple" because the fruit was preserved in honey for jam. The Portuguese called it "marmelo", a corruption of the word melimelum and enjoy their "marmelado", a favored quince confection. The Greek name "cydonia" became "cotogna" in Italian and "coing" in French. Chaucer wrote of "coines", a word that later became "quince". The British love its bold taste in tarts and pies. Believed to be native to Iran, its botanical name, Cydonia oblonga, is derived from an area of Crete. Quince cultivation spread to South East Europe and to the Levant even before the apple took root. 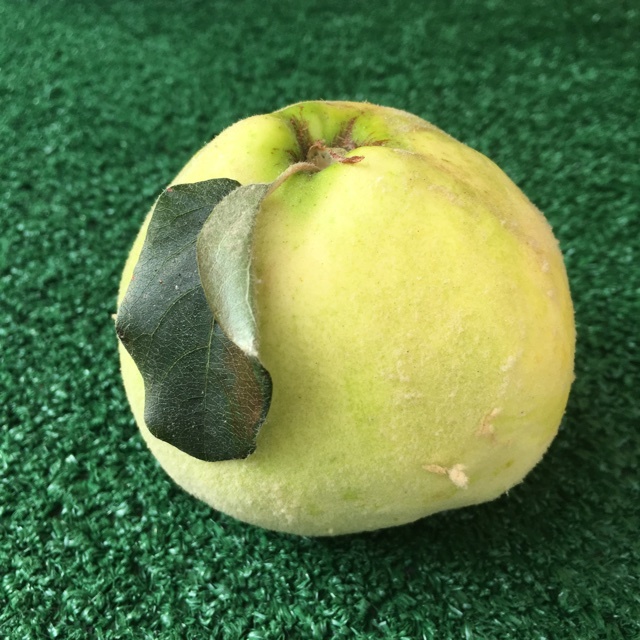 Around 1000 B.C., researchers say Palestine was familiar with quince and the "apples" mentioned in the Song of Solomon were possibly quinces. The small, twisted quince tree bears fruit of several forms varying in size, color and shape. Recipes that include Quince. One is easiest, three is harder. 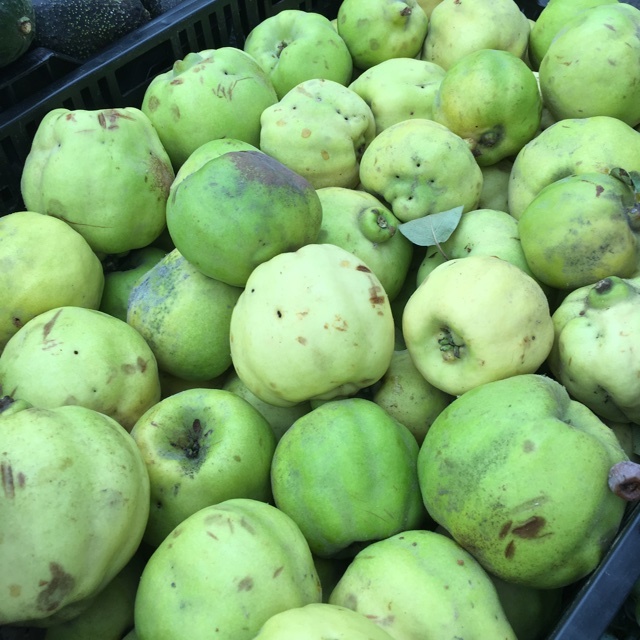 People have shared Quince using the Specialty Produce app for iPhone and Android. 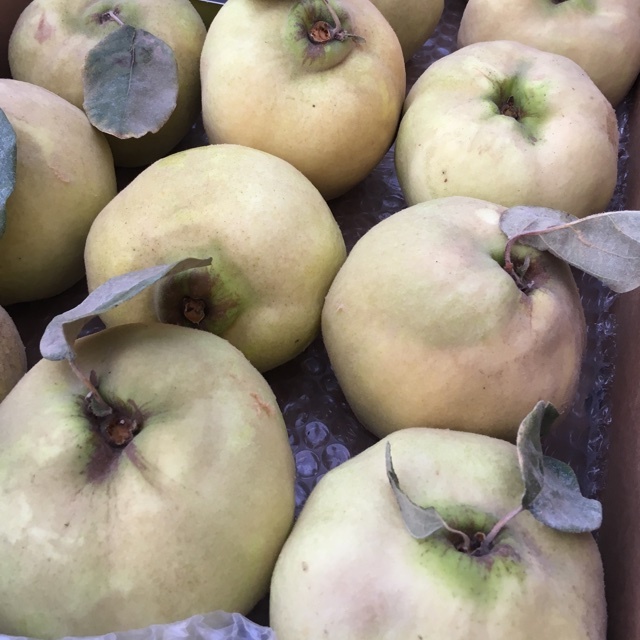 Sharer's comments : Fresh Quince! 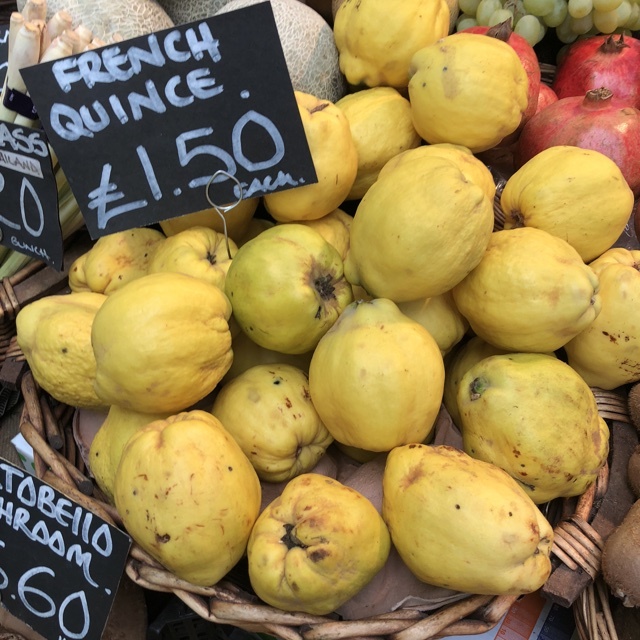 Sharer's comments : Quince spotted at Marche Rue Mouffetard . 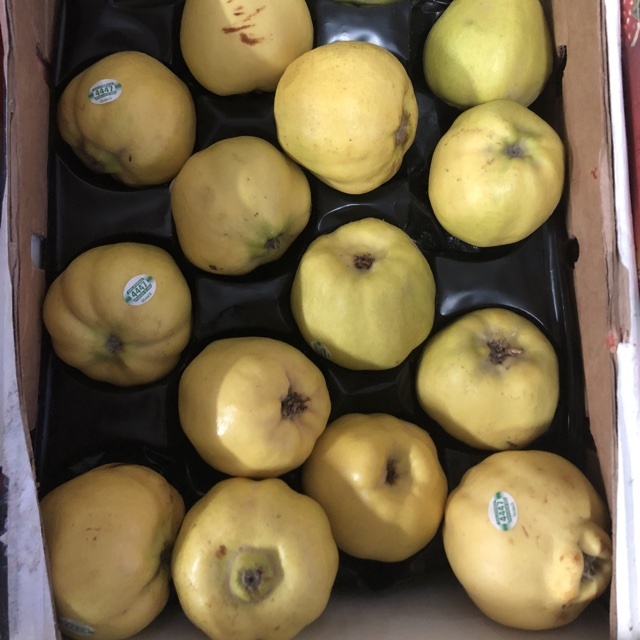 Sharer's comments : Quince spotted at Specialty Produce. First of the seasom pineapple quince from Terry Farms. 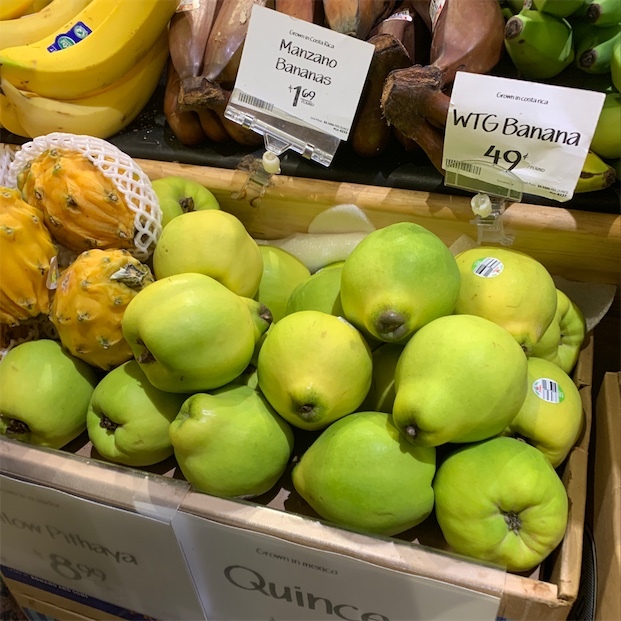 Sharer's comments : Quince spotted at Tomavo. 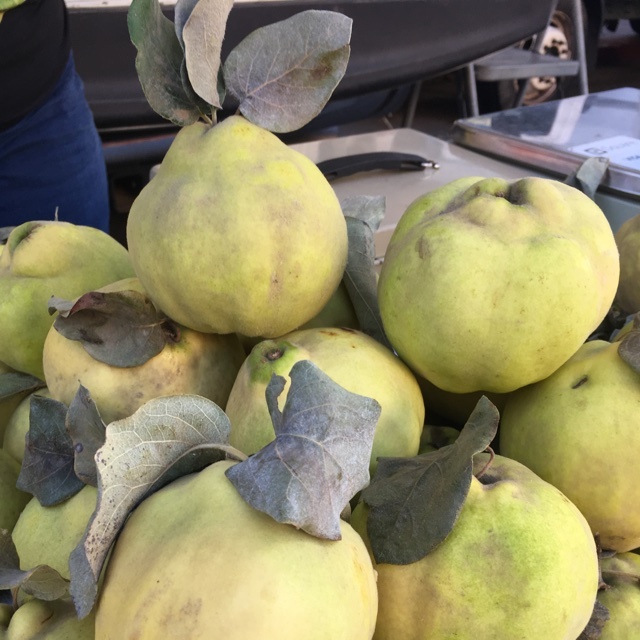 Sharer's comments : Quince spotted at Santa Monica Farmers Market. 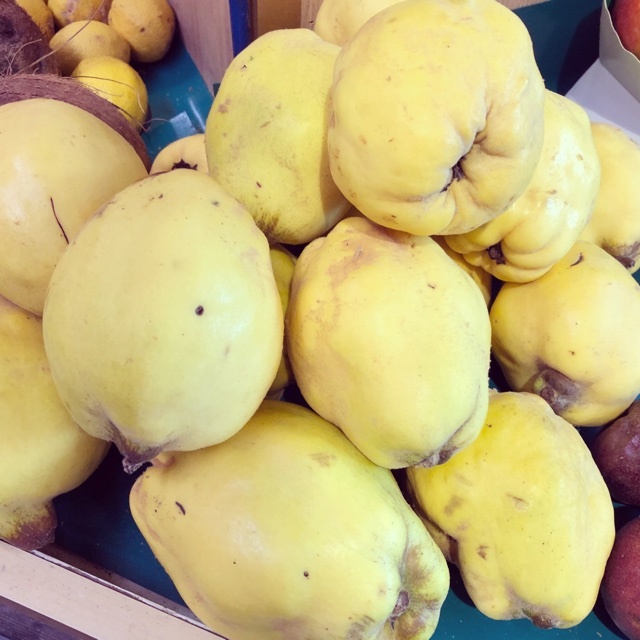 Sharer's comments : Quince spotted at Little Italy Mercato. First of the season. Eat raw or slow cooked with vanilla.